"Torment" - Part 3: "Helpless"
The Scarecrow has Superman under his control and transports the Man of Steel to Apokolips. Desaad injects a crystal into Superman's forehead, which cements their control over his mind. After meeting with Lois Lane, who recounts Clark's outburst at the restaurant, Batman continues his search. The trail leads to the Scarecrow and after fighting what looks like monsters the Dark Knight sees past the effects of the Scarecrow's fear gas and knows that he is facing nothing more than wannabe gangstas and the Scarecrow himself. Crane escapes via Boom Tube but Batman manages to follow and is transported to an alien world. He spots Superman flying overhead and follows him as he meets with Darkseid and Desaad. After hearing that the Superman he knows is dead and gone Batman is spotted and goes on the run. 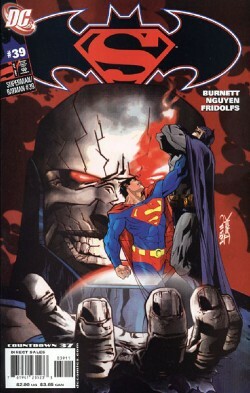 Superman joins the chase and suddenly Batman is forced to square off against his friend and sometime partner. Story - 3: So Batman is going to have to fight a mind controlled Superman. Well good. That hasn't happened lately. Oh wait. It has. Like two story arcs back it happened. And then during Jeph Loeb's final arc. And then during the HUSH storyline. Ok, so I am trying to be funny and probably failing but hasn't this been played out a whole lot lately? It is just further proof that this book has become what JLA became before it was cancelled and replaced; a repository for people to tell those Superman/Batman stories that have been kicking around in their heads for some time. Then again I might be wrong, but that's certainly what it feels like. I cut Burnett a lot of slack because of his animated connections to the characters but still. I want to enjoy this story more but it's hard to get into it because of what has come before. Sure the whole Scarecrow hooking up with Desaad and Darkseid returning has been great. I'm just getting a little frustrated with this book. Art - 3: Not bad. In some spots, like the last panel of Superman and Batman facing off, it was even good. I just haven't warmed up to the style yet. This could change before it's all over but frankly we're three issues in and I am just not feeling the love. Cover Art - 5: While the interior art fails to grab me this was a really solid cover. Nguyen and Fridolfs came together to draw one great looking cover and it really deserves the five I gave it.